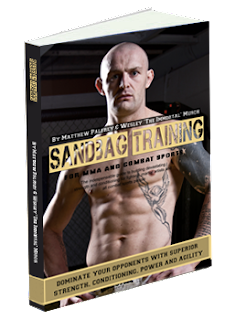 My new book Sandbag Training For MMA & Combat Sports is out this coming Wednesday (18th July) and you can now access an exclusive FREE 60-page sample of the book. Thank you for the sample Matt!! Do you think this book is useful for rugby players, or should the workouts be changed a bit to fit this purpose?? Hi Gabriel - it certainly would be useful for rugby players although some of the workouts might need to be adapted a little. Many of the exercises would crossover though. Maybe my next project?! I read the sample for MMA and it is great! If i decide to start any combat sport, I'll buy your new book! I have considered it before so who knows. Glad you enjoyed the sample and thanks again for the support!